Once upon a time there was a Bribri Indian chief named Pabru Presberi who was master of some big, exceptionally beautiful birds called “Pa”. Everywhere the chief went large groups of Pa flocked around him. Some were red and others green, and all were covered with stunning, bright colored plumage. One day some strange men with beards from a far-away place called Spain arrived on the shores of Costa Rica. Awed by the beauty of the Pa the Spaniards killed them for their feathers which they took to their homeland as gifts for the royalty. The word “la” in Spanish means “the” in English, so they referred to the birds as “la pa” which was later shortened to “lapa”. As time went on there were less and less lapas. The Spaniards had killed all but the large flock that followed chief Pabru everywhere he went. Eventually the chief led a revolution against the Spaniards, so they captured him and took him to Cartago where he was imprisoned. The lapas followed. Eventually the Spaniards executed the chief and the red lapas flew away to the Pacific coast and the green lapas to the Caribbean coast. To this day that is where they reside. Of course, in English, the lapa roja (Ara macao) is the scarlet macaw, and the lapa verde (Ara ambigua) is the great green macaw. Their numbers have diminished drastically over the years to the point that the great green macaw is now listed on the IUCN red list as endangered. The scarlet macaws, which were once seen in large colorful flocks up and down the entire Pacific coast, have also diminished, but not to the extent of their green cousins. It is estimated that today there are about 600 scarlet macaws in the Osa Peninsula and 400 in Carara National Park. They disappeared from the area between Manuel Antonio and Uvita in the 1960s. It is the same old story that has led to the local extinction of so many species like tapirs, jaguars, white-lipped peccary, and brocket deer, among others; habitat loss and excessive hunting. At the beginning of the last century the area around Hacienda Barú was covered with rainforests replete with all of the species mentioned above. As settlers colonized the area they cleared the land and killed the wildlife. As the forest was felled the large old trees, so necessary for nesting sites for the scarlet macaws, were lost forever, and reproduction diminished. Hunters killed the birds for their feathers, and for the pure perverted pleasure of seeing them fall dead. One former resident of Dominicalito told me of an occasion when he was talking to a man who had been out hunting and had a 22 calibre rifle with him. It was late afternoon and seven scarlet macaws flew into a nearby tree to roost for the night. “Watch this,” exclaimed the smiling hunter. “Those birds are so stupid that they will just sit there and let me kill them all”. One by one he shot them off of the branch and watched them fall to the ground. “See what I told you?” he bragged. “Look how stupid they are”. In the mid-1960s there were five scarlet macaws left in the village of Hatillo, and two local hunters vowed to kill them all. They made a bet of ¢100 colones (about $15 at the time). Each claimed that he would kill more of the five. After a few days each hunter had killed two scarlet macaws, but the remaining bird had evaded them both. One day the two were talking when that last big red bird flew into a tree within shooting distance. Both took aim and fired at the same moment, and the bird fell dead. But neither could claim the ¢100 colones as there was no way of knowing which hunter’s bullet had killed the last scarlet macaw in Hatillo. But times change and people change. By 1985 Hacienda Barú, with 180 hectares (444 acres) of rainforest, was the only forest reserve of any size left near Dominical. All the surrounding area, with the exception of a few small parcels of forest on the steepest hillsides, had been denuded. 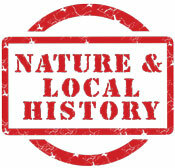 That was the peak of the deforestation and marked the beginning of the restoration of natural vegetation to the area. Land usage has changed from farming and ranching to recreation and tourism bringing with it the regeneration of much of the forest habitat where wildlife once abounded. And the wildlife is returning. When I first came to Hacienda Barú in 1972 the white-faced capuchins were the only species of monkey. Since that time the spider monkey, howler monkey, and squirrel monkey have returned. Their numbers are still small, but they are growing. The puma has returned, a strong indication that the ecological health of the area is in good enough condition to support large predators. At the annual membership meeting of the Asociaciòn Amigos de la Naturaleza (ASANA) in the year 2009 Don Walter Odio, member of the board of directors of ASANA and owner of Rancho La Merced nature reserve in Uvita, interrupted the meeting to announce that he had just received a text message that a group of scarlet macaws had landed in some trees at Rancho La Merced. It was the first sighting in Uvita in over 50 years. That same year some macaws were sighted in the Dominical area and at Hacienda Barú. In 2012 scarlet macaws acted like they wanted to nest in a large ceiba tree, but it was a young tree and they probably couldn’t find an adequate hollow that would work for a nest. This prompted us to build some nesting boxes. We secured four of them in the tops of trees where we had seen the macaws, but the big red birds didn’t seem interested. One day one of the Hacienda Barú guides thought he saw some movement near the opening of one of the boxes. Thinking there might be a chick inside he focused his spotting scope on the opening only to discover that the box was inhabited by a hive of Africanized bees. We checked the other three boxes, and all were full of bees. Getting the boxes out of the trees was quite a chore, but we managed it, and don’t plan on putting up any more nesting boxes until someone figures out how to make them bee proof. The most important threats to the macaws are the poaching of chicks from nests for sale on the black market, and lack of adequate nesting trees. Hunting no longer appears to be a major problem, and over the last 25 years the poaching of chicks has become less of a threat than it used to be. The reason for this is that the demand for scarlet macaws for pets can easily be supplied by chicks raised in captivity. Wild macaws poached from their nests no longer bring the high prices they once did. Lack of adequate nesting sites is still the main threat to the big red birds. 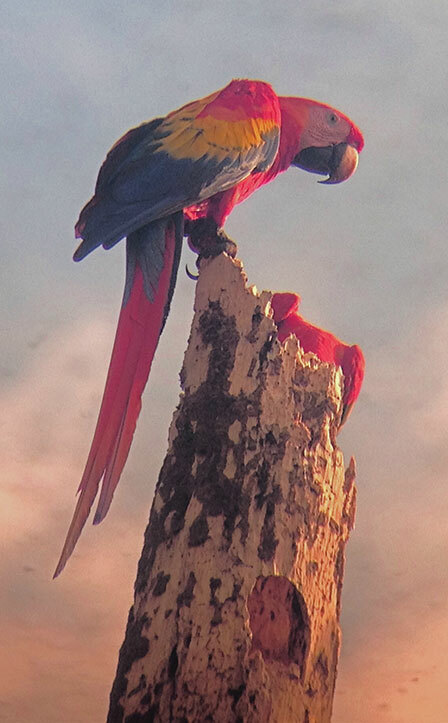 Fortunately macaws have been observed nesting in some very fast growing softwood trees called gallinazo and balsa which are common in newly regenerated secondary forest. Hopefully, the macaws will learn to nest in more of this type of tree. The scarlet macaws that have been seen in Dominical and Uvita have probably migrated into the area from the Osa Peninsula, and the ones in the area around Quepos have probably come mostly from releases of birds raised in captivity. The first release took place in 1998 when the former owner of Gaia Rescue Center released 21 birds at El Silencio close to the Savegre River. These macaws were a mixture of birds raised in captivity at Gaia and birds that had been brought to the rescue center by wildlife officials. Most had been confiscated from people and hotels who were holding them in captivity illegally. 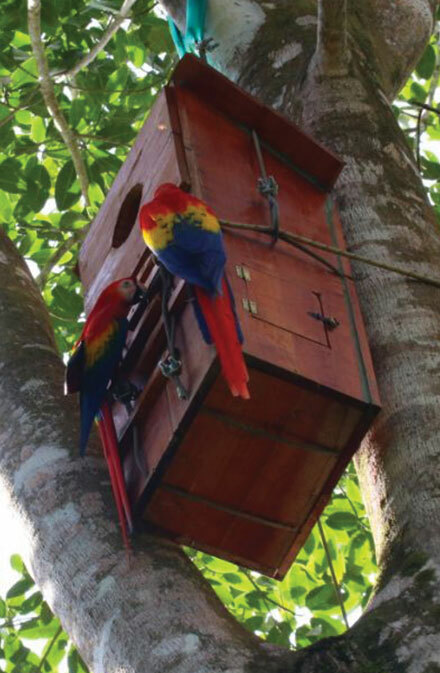 The year after the El Silencio release six pairs of scarlet macaws invaded houses, offices, and tool sheds within the community and made their nests in mattresses, cupboards, closets, and attics. They made quite a mess. Some of them successfully reared chicks. The second year they all ventured off into the wild. 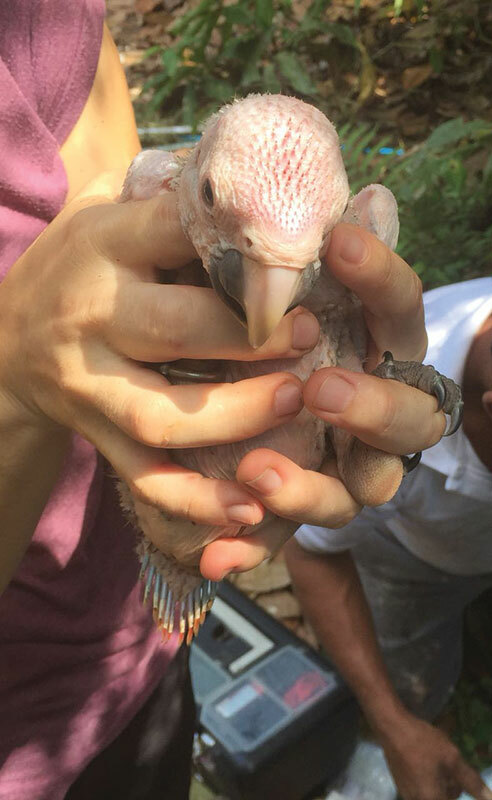 Ana Marìa Torres Msc, is executive director of the non-governmental organization ASOMACAO, which now operates an aviary in the same location as the old Gaia rescue center. Among other things they raise scarlet macaws and release them into the wild. At this time they have 24 birds, 15 of which are for reproduction and 9 for release. Additionally they have secured nesting boxes in trees where semi wild birds can raise their chicks. From one of the nesting boxes seven chicks have been successfully raised and fledged in 3 years. Many of the released birds have been seen flying across the coastal highway and up to higher elevations. ASOMACAO is interested in monitoring the movements of these birds, and you can help. If you see any scarlet macaws anywhere around Quepos or south to Dominical and Uvita send a message via WhatsApp to 6396-9063. Give the date, time of day, number of birds, and the location. Your collaboration will be very much appreciated. 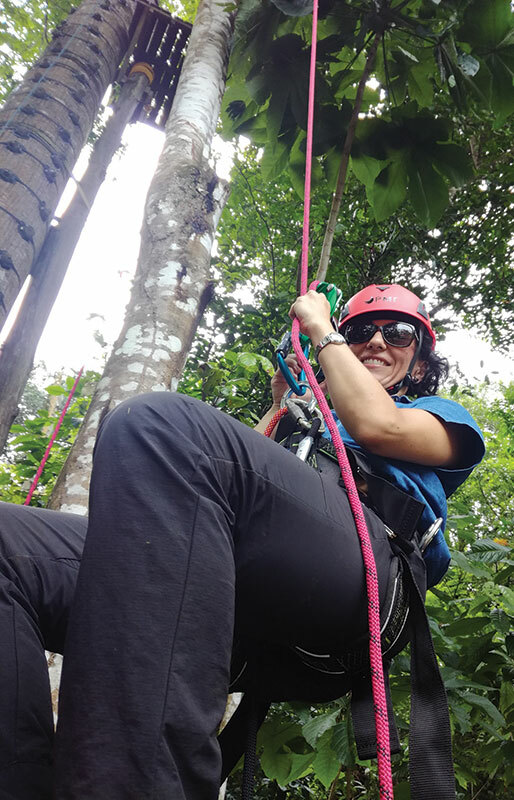 Ana María, who is not only a veterinarian, but also holds a master’s degree in Conservation Medicine, is totally dedicated to the ASOMACAO project. When she asked for help from Hacienda Barú for climbing into the tree tops to place the nesting boxes we readily agreed. She has learned to climb and now attends to the nesting boxes herself. She once placed a camera near the opening of a nesting box to watch for activity within. One of the chicks stood in front of the opening on the box constantly for about two weeks waiting for the adults to tell it that the time to fledge had arrived. One can only imagine it whining, “Mommy, mommy, when can I go? When can I go? I want to go now”. 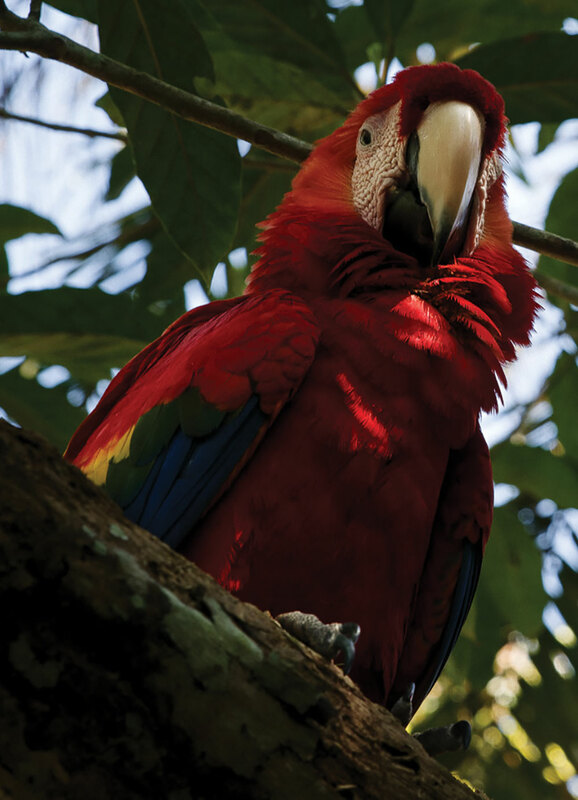 Punta Leona Hotel is located near Carara National Park, and many scarlet macaws hang around the location. The hotel staff have been observing macaws for a long time and know their habits well. On their web site there is a list of 10 curiosities about the big red birds. Number 7 really caught my attention. It says that most scarlet macaws are left-handed. They use their left legs almost exclusively to eat and groom or whenever they need to grasp something. Ana María is going to pay close attention to the macaws at ASOMACAO to see if they too are left-handed.